Lobsters may be colored to any hue desired to suit the particular scheme of dinner decoration simply by putting coloring matter in their food, according to a well-known German scientist. He discovered that they turn red after they are boiled because of the action of the heat upon a chemical in their shells. Most amateurs usually hold off painting jobs in and about the home until warm weather. This may be good practice in one way, but at that season of the year the newly painted surfaces are very attractive to insects and if they get on the paint - as they naturally do - the appearance is ruined. A good method of preventing this and particularly caluable when painting seats, arbors and other garden furniture, especially if they are painted white or some light color, is the addition of ½ pt. of cedar oil to every gallon of paint. This oil will not injure the paint in any way. Very little turpentine should be added to the paint, if it is ready-mixed. The cedar oil is so effective that it more than justifies the slight expense incurred. Its odor will be objectionable to the insects, and the paint will have a change to dry before it can be spotted, which it cannot fail to be if no precaution has been taken to keep the pests away. - L. H. Geroger, Buffalo, N. Y. The electrical method of making aluminum amalgam by creating arcs between aluminum-foil electrodes and a drop of mercury. It is adcisable to wear tinted goggles, to protect the eyes against glare. Paper impregnated with lead acetate reveals the presence of sulphur in ordinary laundry "bluing"
To perform a variety of entertaining experiments with aluminum and its compounds, an amateur chemist need not look far for materials. The kitchen yields the metal in the form of old pots and pans and their lids; spoons, tea balls, and salt and petter shakers. Powdered aluminum, sold for use in paint, provides another source of supply. Aluminum sulphate is familiar to scientific gardeners, for this compound of aluminum is commonly used to counteract excessive alkalinity of the soil. Alum from the household medicine chest - a compound chemically known as potassium aluminum sulphate - can be used directly in some experiments, and also will enable you to manufacture aluminum salts that you otherwise would have to purchase. Dissolve some of the alum in water and add sodium hydroxide or ammonium hydroxide solution to it. Household lye or ammonia will serve the purpose. The jellylike precipitate that is formed consists of aluminum hydroxide. Was it by decantation - that is, let it settle, pour off the clear upper liquid, add freh water, and shake, repeating the process several times. Then strain out the precipitate. It must be filtered from the liquid with a cloth, as water would drain off from it too slowly through filter paper. Now you can prepare other compounds of aluminum at will, by dissolving the paste in various acids. For aluminum sulphtate, sulphuric acid is used; for aluminum chloride, hydrochloric acid; and so on. If you jeat aluminum hydroxide strongly you will get aluminum oxide, also known as alumina. Many metals yield colorful sulphides when hydrogen sulphide gas bubbles through solutions of their salts. Aluminum sulphide, however, interacts with water and decomposes as fast as it forms, producing aluminum hydroxide. Most of the compounds of aluminum are white, like this one. Ultramarine, familiar as a pigment in household laundry bluing and in blue paints, is an exception. Artists once ground up the rare mineral lapis lazuli to obtain it. Nowadays it is made synthetically. It contains aluminum in combination with silicon and other substances. You can prepare it on a small scale, using for ingredients about ten parts of kaolin (the white clay used in making porcelain), ten parts of sodium carbonate, and five or six parts of sulphur. Put the mixture in a porcelain crucible, cover it with a bit of charcoal, and set the lid of the crucible in place. Heat the contents with a Bunsen-buerner flame fr fifteen minutes. Then pour out the mixture into a flask and boil it with some potassium sulphide solution. This brings out the blue color. the kaolin used in this experiment, which supplies the aluminum, is known also as China clay, and may be obtained from chemical supply houses and from many drug stores. The potassium sulphide often goes by the name of liver of sulphur. The "bluing" you have made contains sulphur in the sulphide form, as you can easily show by droppping some acid upon a fragment of it. You will instantly notice the foul odor of hydrogen sulphide gas, liberated from the sulphide by the acid (P.S.M., Jan. '36, p.54). If you moisten a piece of paper with lead acetate or lead nitrate solution, and hold the strip near the acid-treated bluing, the paper will turn brown or black, because of the formation of lead sulphide. You can try out a peculiar method of waterproofing fabrics, in which aluminum plays a part, by mixing a solution of aluminum sulphtate with one of lead acetate. The heavy, white precipitate of lead sulphate that settles from the liquid is not concerned in the experiment. The clear liquid remaining contains aluminum acetate. When cloth is dipped in this olution, the aluminum compound soaks into the fibers. It turns into aluminum hydroxide by interaction with moisture, and impregnates the fabric. In drying, the cloth becomes so water-repellent that it can be wet only by the most strenuous efforts. Artificial coloring for aluminum articles is a recent development, and you can duplicate this interesting process in your home laboratory. The secret lies in forming a coating of aluminum oxide upon the metal and then impregnating the exide, which acts as a sort of adhesive, with a dye or a chemically produced pigment. Boil an aluminum object or a strip of the metal in a solution of sodium or potassium dichromate and sodium carbonate. This will produce the desired coating of oxide. Then wash it, and it will take on the chosen tint when it is immersed in a dye solution. The film of aluminum oxide "absorbs" or takes up the dye so that the metal itself appears colored. A yellow hue may be obtained without recourse to a dye, by immersing the oxide-coated aluminum first in a lead acetate solution and then, without washing, in a solution of sodium or potassium chromate. This precipitates a yellow chemical pigment, lead chromate, in the oxidized coating. Another process, now employed commercially, forms the aluminum oxide electrically. The article to be colored is placed in a twenty-five percent solution of sulphuric acid and connected to the positive terminal of a source of direct current. If the tank containing the acid bath is of lead, it is connected to the negative terminal; otherwise, a strip of lead immersed in the acid serves as the negative electrode. Within certain limits of temperature and current strength, the coating of oxide is produced, and then is dyed or otherwise colored as before. Making colors adhere to aluminum with the aid of its oxide recalls the common use of aluminum compounds as "mordants" to assist in dyeing cloth. In this case, aluminum hydroxide is the compound employed. To demonstrate its affinity for coloring matter, dissolve some Congo red dye (obtainable from dealers in chemical supplied) in about 300 cubic centimeters, or roughly ten fluid ounces, of water. Add aluminum hydroxide to the dye solution and boil the liquid for several minutes, swirling it about in the beaker or flask every minute or so. Now pour the liquid into a piece of filter paper folded in a funnel. the filtrate, or liquid that passes through the filter, will be clear, showing that the dye has been "adsorbed" by the aluminum hydroxide remaining on the filter paper. Almost any other dye solutions, such as colored inks that you may have about the house, will give the same result, and you will find it interesting to try them. A quantity of aluminum hydroxide sufficient for this experiment can be prepared by adding ammonium hydrozide to about ten grams (two teaspoonfuls) of alum dissolved in water. The precipitate should be washed by decantation, as explained in an earlier paragraph, before you use it. By comparing the effects of varous dyes on untreated cloth and the "waterproofed" cloth that you prepared in another experiment, you can observe the part that aluminum hydroxide plays as a mordant in actual dyeing. Dyes that have no effect on the plain cloth will effectively color the piece impregnated with aluminum hydroxide. Another way to prepare cloth for this dyeing test is to dip a piece of white fabric first in aluminum sulphate or alum solution, and then in dilute ammonum hydroxide, to precipitate the aluminum hydroxide in its fibers. Powdered aluminum, sold for use with a varnish as aluminum paint, gives a dazzling wgite light when it is blown into a Bunsen-burner flame. The metallic powder liberates hydrogen when it is heated with sodium hydroxide solution, providing a convenient laboratory supply of the gas. By mixing finely divided aluminum with powdered magnetite or magnetic (ferric) oxide, the welding preparation known as thermite is obtained. Ignite it in a crucible, and the aluminum combines with the oxygen of the iron oxide and leaves the iron. So much heat is generated in the showy reaction, one of the most spectacular in chemistry, that sparks of molten iron fly from the white-hot mixture and soar through, the air like meteors. After the experiment, a button of solidified iron is found in the crucible. Neither a match nor the flame of a Bunsen burner gives enough concentrated heat to touch off the thermite mixture. A small heap of a starting preparation must be placed on top of the chemicals and ignited. This may consist of equal parts by weight of potassium chlorate and sulphur. Another formula uses two parts of aluminum powder, two parts of potassium perchlorate, and one part of flowers of sulphur, also measured by weight. Do not use potassium chlorate in the latter preparation, as it would then be too sensitive to shock and might take fire or explode with slight friction. Aluminum and mercury combine with each other to form an amalgam or alloy of curious behavior. Sandpaper a sheet of aluminum until it is clean and shiny, drop it into a bottle or flask, and shake it with several drops of mercury. You will not need much of the quicksilver; in fact, the small amount reclaimed from the bulb of a broken thermometer will be plenty. The agitation makes the mercury adhere to the cleaned surface of aluminum, or "amalgamate" with it. Now, if you remove the aluminum strip and expose it to the air, small white tufts of featherlike hairs will begin to grow upon it. You can actually see them getting longer as you watch. They consist of alumina, or aluminum oxide. Immerse the amalgam-coated strip in water and it will decompose the liquid, liberating hydrogen gas. You can prove it is the amalgam that does this, for if you place a small drop of mercury and a plain strip of aluminum in water nothing will happen until they touch each other. Electric current offers another way of making the aluminum-mercury amalgam. Roll up two pieces of aluminum foil, taken from candy bars or photographic film, and connect them with battery clips to a storage battery pr a group of dry cells. House current may be used instead, if a heating element of 600 or 660 watts is interposed in the circuit. Holding the pieces of foil by the insulated part of the wires attached to them, touch the aluminum strips simultaneously to opposite sides of a drop of mercury, and then pull them away. A brilliant arc is produced. It is a good precaution to wear a pair of tinted goggles to protect the eyes, and the fumes rising from the arc should not be breathed, as the mercury vapor is poisonous. One or two arcings are sufficient to produce the amalgam. Lay down the pieces of foil, watch them for a minute or two, and you will see the mosslike growth of white alumina appear. The same result can be produced still more effectively by immersing a discarded aluminum tea ball or salt shaker for half a minute or so in a hot solution of mercuric chloride (bichloride of mercury), taking the special precautions that are due this poisonous chemical. Wash your hands carefully after using it, and make sure that nothing you have placed in the solution finds its way back to the kitchen by any mischance. Remove the dipped object, rinse it with water, and hold it exposed to the air. it becomes warm as the white feathery fronds appear on it, and at times cannot be held in the hands. You can repeatedly wipe off the strange growth, wash the article in water, and dry it with a cloth - and still, after half a monite or so, the alumina tendrils will sprout again! As much as a teaspoonful of the peculiar white substance can be collected from the object. Tiistaina seitsemäntenä (7) päiwänä tulewassa joulukuussa tapahtuu julkinen huutokauppa suutarimestari Jaakko Lakson kartanossa Hisian perintötalossa Lapuan pitäjän kirkonlylässä, jossa Wärjäri Tuomas Lindberg'in konkurssipesän omaisuus, nimittäin yksi kyyppi, kaksi pannua, huonekaluja, niinkuin möpeleitä ja muita, ja kaikenlaista muuta omaisuutta, joka täten julistetaan, Lapualta, 18 p. marraskuuta 1880. Dyes for plastics can be obtained in all colors and are a useful aid to the craftsman seeking decorative effects. The actual job of dyeing is simple - just dip the plastic, let it soak from 1 to 5 minutes, depending on depth of color desired, and then rinse in running water. Although the dye is a surface coat, it bonds perfectly. The dye vat can be any kind of tall can or a glass tubler. A metal tube, flattened as in Fig. 2, is useful for dipping long strips. A coarse metal screen, Fig. 1, keeps the plastic clear of the container bottom. Dyes can be rebottled and used repeatedly. However, the dye evaporates very quickly in an open dish. Keep it away from an open flame when using. Although over-all colors are the most practical, it is possible to obtain two-tone effects by masking. Fig. 3 shows a plastic square masked by dragging liquid glue across it to form a pattern. After dyeing, the glue washes off in the water rinse, exposing the pattern as in Fig. 4. Silhouettes and straight lines can be similarly worked, thinning the glue as needed. Paper masking tapes are not suitable as the dye seeps under the edges. A special masking tape is available which is designed to avoid this fault. Dyes are easily made as in Figs. 5, 6 and 7. Just use a drypowder stain soluble in oil, the same product that is used in making wood stains. Mahogany makes a nice red; walnut a clear yellow. If prepared plastic dyes are used, they should be straight colors: oil red, oil blue, oil green, etc. Excess stain and impurities are filtered out, Fig. 8. Most drugstores carry filter paper and acetone. Laminating dyes are made by dissolving a few shavings of thermoplastic in 1C cement which is used in cementing this "glass" product. Then add oil stain for color. This product cements and dyes in one operation and is particularly good for mottles as shown in Fig. 8. The various colors should be streaked on with a matchstick, Fig. 9. They probably will dry before the job is complete, but are redissolved by quickly applying a generous portion of clear cement - heavy type with shavings added - to the center of the work, after which the top piece is pressed in place. Squeeze gently to spread the cement adn force out air bubbles. If clamping pressure is used it should be very light. Dye inlays can be worked with plain dye by using a glue mask as already described, or by using the laminaring dye. The latter can be masked off to a sharp, clean edge. Finished inlay, Fig. 10, is perfectly bonded. The original paper cover on plastic can be used as a mask, cuttig out the desired figure with a stencil knife, Fig. 11. Colored dye-cement must be applied by flow-coating, as shown in Fig. 12. It is impossible to spray or brush the material because of rapid drying. Thus applied, the design will be translucent and will have a gloss equal to the plastic. Concentrated dyes which can be mixed with 8 to 12 parts of water are available and are useful for certain types of work. Application requires heating the dye bath to about 190 deg. and then immersing the work for 1 to 5 min., depending on depth of color desired. However, heat of the dye bath tends to warp the plastic. For most craftwork the chemical dyes are preferable. In general, work to be dyed can be colored before or after assembly. If dyed before assembly, the pieces should be cut to net size. If any color effect is unsatisfactory, remove it by using a clear dip of acetone and water. Similarly, if a two-tone effect is wanted, the piece can be dyed one color all over, then dipped in a second color which will strip the first coat and deposit the second on exposed areas. An instant dip and rinse will color sanded edges. Eräällä talonpojalla oli monta wuotta ollut tuwan seinällään onnettoman keisarinna Elisabetin kuwa puitteissa ja lasin alla. Eräänä päiwänä talonpoika hämmästyksekseen huomasi että puitteista wuosi werta. Ilmiö herätti suurta hämmästystä koko kylässä ja siitä wietiin tieto papille. Tämä läksi talonpojan luo, kuwa otettiin seinältä ja huomattiin että se todellakin oli aiwan werinen. Se puhdisteltiin ja pantiin takaisin puitteisiin, waan kun pappi jonkin ajan jälkeen taasen tarkasti kuwaa, huomasi hän uudestaan werta tihkuwan puitteista, Nyt oli kaikki wakuutettuja siitä että ihme oli tapahtunut. Pappi pyysi ja sai kuwan ja ripusti sen kirkkoon. Seudun rahwas oli wakuutettu että tämä ihme oli yhteydessä keisarinnan kuoleman kanssa. Ihme on kuitenkin myöhemmin saanut hywin luonnollisen selityksen. 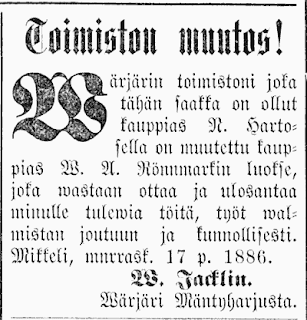 Muuan tiedemies, joka luki jutun sanomalehdessä, on kirjoittanut toimittajalle kirjeen selittäen että punanen wäri arwatenkin on erään basilin, basillis propigiosusin, synnyttämä. Lämpimässä tuwassa pienoiseläimet sitäpaitsi synnyttiwät limaista ainetta, joka punaisen wäriaineen yhteydessä luultiin wereksi. Numerous methods are suggested for coloring pictures to imitate firelight, most of them depending upon the staining of the entire picture with some dye, but few giving satisfactory results. However, a combination of dyeing and chemical toning will give a satisfactory effect. By staininig an entire picture light orange and toning the dark portions red, a fine imitation of firelight is obtained. Any developing paper can be used. For the best results, the picture should be printed deeply; the print is first immersed in a bath consisting of 10 grs. of potassium iodide, and 20 grs. of potassium ferricyanide, dissolved in 1 oz. of water. This solution should be made in quantity as required, and the potassium must be the red prussiate crystals, not the yellow. The picture, immersed in this solution, will bleach away almost entirely, but must be left in the bath half an hour longer to convert the nitrate on the print completely into iodide of silver. This chemical is capable of taking up or "mordanting" many aniline dyes, but not all of them. The dye, which is red in case of firelight scenes, is then applied; lanafuchsine is the dye to use. After washing out the dye completely, another color such as yellow or orange, in the case with campfire scenes, is applied to the print to stain it completely and to deepen the red tint in the shadows. in this way the print can be dyed almost any color and tint desired. A good dye is necessary for successful work. The quality of any red dye can be seen when the print is washed; if any of the whites remain tinted, the dye should be rejected. This process of coloring can also be applied to moonlight pictures of landscapes, using blue or green dyes, or even liquid water colors with a brush, as the print will take almost any aniline dye. It is not necessary to place the print in the dye, but better to apply the dye with a brush, paying no attention to the outlines of the picture, as the dye will act only on the chemical portion. If the dye is not strong enough after washing, a second application is made. This process is also a splendid one for coloring lantern slides, as the silver can be dissolved entirely in an ordinary fixing bath during the process. The slides will be of a soft and delicate appearance and can be tinted with water colors afterward. A French experimenter recommends the following dyes: For red, lanafuchsine brilliante S L; blue, cyanol d'alizarine B F; yellow, jaune de quinoeline; green, vert brilliante d'alizarine; violet, violet lanacyl B. Colors of every tone and shade, to the number of 1,4000, are displayed in an index recently issued. There are no duplicates in the list, which was compiled from the productions of dye makers all over the world. Many scores seem exactly alike to the eye, but tests show that they are not. America sent samples from twenty-nine factories, while England and Germany were each represented by thirty-two. piirustettaman ettei sitte kun rakennus on walmis löytyisi odottamattomia puutoksia hyödyllisyydessä, lujuudessa ja kauneudessa. Mitä hyödyllisyyteen ja lujuuteen tulee, siitä olemme jo edellisissä n:roissa puhuneet kaikkein painawimmista asioista, mutta nyt on wiela wähäisen mainittawa kauneudestakin. 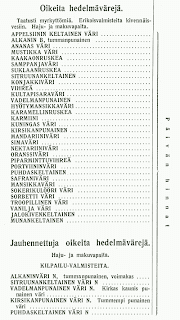 Rakennuksien kauneus on osittain muodossa, osittain wärissa; ja erheykset kummassakin loukkaawat siwistyneen katsojan kauneustuntoa. Niinkuin puu joka kituwaisesti kaswaa, tahi joku eläwä, jota on kaswanut wirhillisiin muotoihin ei ole kaunis. Rakennuksien kauneus on myöskin heidän mukawuudestansa, niin että niissä ei ole mikään osa suunnattomasti ja muotopuolisesti taikka karsaasti, waan että kaikki osat owat niin mukawassa yhteensopiwaisuudessa ja suhteessa toistensa kanssa, että koko rakennusta woipi mielisuosin katsella niinkuin kaunista hewoista taikka muuta Jumalan luomaa olentoa, jossa yksi osa auttaa toisensa kauneuteen, niin että se kokonaisena kaunis on. Rakennuksissa ei pidä olla mitään osa liiaksi ohkainen, hoikka eli lilakn paksu; kaikki pitää silmännäön ja luwunlaskun kautta olla määrätty, niin että jokainen osa on eli näyttää olewan niin luja, että se woi kantaa sen päällä olewan painon, ja niin että se näyttää täydellisesti yhtä sopuiselta sen lujuuden kanssa mitä muissa osissa on käytetty. Maalaus antaa rakennuksille wiimeisen kauneusmuodon ja maalarilla on kauneusmuodon mallina koko luonnon suuri waltakunta monine muotoinensa ja wärinensä. Maalilla kuwaileminen on silloin kaunis, kun se on yhdenlainen luonnon kanssa. Senlainen maalari, joka saattaa kuwitella maalauksensa luonnon mukaisilla kaunistuksilla, joko täysillä kuwauksilla taikka luonnon mukaisilla juomilla ja wiiwoilla, se on mestari taidossansa. pitäisi keppi selässä poisajettaman kartanoista, kun sillä lailla pilaawat ihmisten omaisuutta. Se on myöskin melkeen ainian kuin hewois- ja ajokalut, aisat, luokat, länget, silat, reet, kärryt ja keesit tykkänänsä pilataan silmää loukkaawilla maalauksilla. Kaunis maali on lempiä, siliä, ja waan hywin wähän silmää suosittawilla maaleilla luonnon jälkeen kuvitettu. Ajo ja hewoiskaluja, eikä myöskään huoneiden sisustoja ei milloinkaan saa liiaksi kuwitella: tawallisesti wedellään wain pieniä wiiwoja ajo- ja hewoiskalujen syrjiin eli ympärystöihin. Aina se wanha sana "kauneempi siliä kuin huonosti kuvitettu", pitää tarkasti muistettama. Tämä sananparsi pitää myöskin tarkasti seurattaman nikkarin ja timperin töissä. Ruma rakennus waikuttaa ihmisen tuntoon melkeen niin pahasti kuin ruma weisu. Mutta kaunis rakennus on niinkuin kaunis laulu waikuttawa rawintoa ihmisen sielulle. Glass bombs resembling electriclamp bulbs, filled with brightly colored paint, are a new British weapon against holdup men. Night watchmen and payroll messengers, carrying supplies of the bombs, are prepared to hurl them at fleeing suspects or escaping bandit cars. The resulting smear of yellow or red ocher paint makes it easy for police to trail the fugitives, and the firing of guns that might endanger passersby in crowded streets and thoroughfares is avoided. To guide rescuers to sunken submarines, and reveal the fate of ships and planes lost at sea, a French inventor proposes dyeing the ocean. Besides the marker buoys that submarines now release in case of accident, he suggests that ocean craft carry self-releasing packages containing fifteen to twenty pounds of a dye like fluorescein, which will give a yellowish-green color to more than 20,000,000 times its weight of water. Visible to aircraft fifteen miles away, the spot should last twenty-four hours. Taatustu myrkyttömiä. Erikoisvalmisteita kivennäisvesiin. Haju- ja makuvapaita. Kirsikanpunainen väri N. Tummempi punainen väri. Q. - Why is it that colors in cloth seem deeper and brighter when wet? - A. F. C., Erie, Pa.
A. - Colors in wet cloth appear deeper in shade because particles of water between the threads of the fabric cause refraction of the light rays. Q. - Why is it that babies' and animals' eyes which are blue at birth frequently change to another color? - O. T E., Cambridge, Mass. A. - Newborn babies or animals, with the exception of hose which have very black eyes, have no pigment in the front of the iris. The apparent lue color of their eyes is propably due to the suspension of exceedingly fine particles in the front of the iris. These particles absorb certain rays of light which, in combination, we recognize as blue. The pigment of the iris, while present at birth, does not become fully distributed until some time later. When I was told, a few weeks ago, that another new process for taking motion pictures in color had been "perfected," I confess I smiled skeptically to myself. I had seen many colored movies before. They had left me either unimpressed or thoroughly displeased. To be sure, I knew that this new method had been invented by a scientist of distinction - Dr. Daniel Frost Comstock, of Boston - and that 10 years of patient research and experiment had gone into its development. I was told that more than $1,000,000 had been spent upon these experiments; that the enterprise had the financial backing of no less a figure than William Travers Jerome, former District Attorney of New York, and that artists and motion picture experts who had seen the film hailed it as a phenomenal improvement, charming in its colorful realism, lessening etestrain, and destined to revolutionize motion picture work. Here is an exact-size reproduction of a section of the new color motion picture feature film, "The Toll of the Sea," starring the young Chinese actress, Anna May Wong. This lifelike move made possible by the remarkable color process invented by Dr. Daniel Frost Cornstock (inset), is called by the artist, Maxfield Parish, "highly successful from a color point of view and an invention with endless possibilities - a revolution in the moving picture art"
And, finally, I had fully shared the great dream of motion picture enthusiasts during the past decade - the dream that the movies some day would be shown to us in all the beauty of natural color, enhancing enormously the power of their appeal. Nevertheless, I did not realize the art had advanced far enough to make this dream a reality. But when I witnessed the private exhibition in New York of this new colored film feature - a play called "The Toll of the Sea," starring the young Chinese girl, Anna May Wong, whose fame has begun to spread eastward from California - I was frankly surprised by the unexpectedly high quality of the color work. Here was a film in which colorful costumes and feminine beauty moved convincingly across the screen, with slight trace of the garishness, flicker, and distracting color fringes that have hurt so many other color films. Not that this color work is perfect. Some of the reproductions of blues and green are bad. The yellows are even less satistying. But this motion picture does constitute, to my mind, the best color work done so far in the films, and the process used, the new Technicolor process, promises still better things to come. For the first time I have begun to expect something really big from color photography on the screen, something that will affect the fundamentals of motion picture art. It isn't only that we may expect enhanced charm of settings, and still greater beauty of feature in out heroines; or that we shall see them blush real blushes, as we now see them weep real tears; that expressions will be more lifelike, costumes more fascinating, natural scenery more magnificient. A successful color movie can do something much more fundamental than this. It can give us not merely an improved art, but a new art; a new kind of dramatic production, differing from the present productions in black and white as completely, perhaps, as these differ from the productions of the spoken stage. How can this be? Because color alone, pure color, has a powerful appeal to the human mind. This is always the great aim of drama - to seize on the emotions, to contrive that you are completely "carried away" by the thrill, sentiment, joy or sorrow of the play. This diagram explains in simplified form the ingenious process of color movie phorography perfected by Dr. Daniel Frost Comstock and fully described in the accompanying article. Two phorographs of an object, such as the flag shown above, are taken at the same instant through the single lens of the movie camera. Incoming light is split in half by a perforated mirror just back of the lens, one half being led through a color filter that allows only blue-green light to reach the film negative, the other half led through a second color filter that allows only red-orange light to pass to the film. Thus the film negative of the flag, shown at the right (slightly reduced), consists of a succession of double images, alternating blue-green and red-orange impressions, but still in black and white. In the positive print of this negative, the blue-green and red-orange images are superimposed, one on the front, the other on the back of the positive film. The positive film then is dyed, the blue-green images taking blue-green dye and the red-orange images red-orange dye. When projected on the screen, the film gives the effect of reproducing all the original colors of the flag in their natural shades. There is no doubt that color has this appeal. Red excites and stimulates us; green is restful and sedactive. To play on people's minds with color as we now play on them with moving images or written words, will require, of course, a completely new kind of directing. There will be new lighting, new make-up, a new technique of screen acting. But first there is a scientific problem - Can it be done? Is the color movie an accomplished fact? As yet we cannot say that it is. But we can say that it promises to be. The new process we are discussing is a long step toward the fulfilment of this promise. George Fitzmaurice, Movie Producer, Says: "As to whether color photography will enchance the dramatic quality and realism of the picture - that is rather hard to tell. I cannot see where natural color will detract from the drama so long as the color remains neutral and unobtrusive. "Still, I think that the great progressive step will be taken when stereoscope photography has been fully developed. And the millennium will come when stereoscopy and color combine to produce the perfect whole. Rupert Hughes, Motion Picture Writer, Says: "It seems to me that color processes in motion pictures will probably follow the same line as in book and magazine illustration: for certain special effects they will furnish great charm, richness, and contrast, but for general use the singletone pictures will enormously prevail. It would be ridiculous to deby the beautiful possibilities of occasional color, though I cannot believe that it will ever drive the monochrome, or one color, process off the screen." This process is a professor's dream come true. Ten years ago, Dr. Daniel Frost Comstock was a professor of physics in the Massachusetts Institute of Technology. He knew a good deal about color photography. He dreamed of applying it to motion pictures. With Mr. Herbert T. Kalmus, his partner in an engineering firm, he went to work. They began experiments. They organized the Technicolor Company and gathered a group of able scientists and engineers. For years the experiments failed. Finally, success began to come. One by one the worst of the technical difficulties were overcome: the difficulty of taking two pictures at once through the same lens; the difficulty of finding the two dyes that were exactly the right ones to use in coloring the film after it had been photographed; the many difficulties that came from the extreme weakness of the light after it had passed through the complicated system of lenses and prisms required for the color camera. Film schrinkage, too, was overcome and the many other obstacles that stood in the way of making the two differently colored images fit exactly one on top of the other when they came to be printed on the same strip of film. Probably you have heard color photo-graphs described as "two-color" or "three-color." Doctor Comstock's films use only two colors to produce the effect of six. To understand what this means, we must recall a few facts about the nature of color and about color vision. Ordinary white light like sunlight is made up, you remember, of six primary colors: red, orange, yellow, green, blue, and violet. You can prove this by putting a glass prism into a beam of sunlight, and noting how it splits the white light into a strip of these colors, a spectrum. You see them in a rainbow. White light is believed to be made up of waves or vibrations of various lengths, each wave length producing a distinct color sensation. Red light from a red glass lamp globe looks red because the waves producing the other five color sensations are held back by the red glass. The orange, yellow, green, blue, and violet waves are absorbed. Only the red waves get through. Similarly a blue globe lets through only blue light, and so on. A red paint or dye is merely a substance that reflects only red ight, absorbing all the others. A yellow paint reflects only yellow light, etc. These are the physical fundamentals of colors. Scientists believe we detect colors through minute, sensitive nerve endings, called "rods" and "cones," in the membrane of the retina behind the eyeball. These nerve endings (shown in highly enlarged cross section at upper right) transmit light stimuli to the brain. But this color theory is partial. It leaves out the human eye. You look, for instance, at an apple. Something happens in your eye. You have a sensation of redness, and impression that the apple is sending red light into your eye. This seems straightforward enough. The eye, you say, must contain some mechanism able to perceive red light as such, able to sort out the light of the six different primary colors and recognize each color by itself. What could be simpler? It is simple, true enough, but it is not what happens. Make an experiment. Take some yellow paint and some blue paint and mix tehm. What do you get? You get green paint. This fact is so familiar that we are apt to forget how startling it is. Think for a moment of what it really means. There are six primary colors. These are separate physical things - different kinds of light. You mix two of them, yellow and blue. You do not get a mere mixture, a yellowish blue or a bluish yellow. You get a third promary color, totally different from the yellow and blue, another one of the original six! What is the explanation? Simply this: The mix-up is in the human eye. The eye does not perceive the six primary colors separately and individually. It confuses and blends them in a very complicated way. Marcus Lowe, Owner of 75 Theaters, Says: "I recently witnessed a showing of a colored moving picture of the Chinese story called, 'The Toll of the Sea,' which was shown by Judge William Travers Jerome. I thoroughly enjoyed the picture and consider the process highly successful. "The picture was made far more effective and convincing by the soft, wonderful coloring." Charles Dana Gibson, Artist-Illustrator, Says: "I have see nall the color processes so far, and the new process represented in the picture, 'The Toll of the Sea,' is far and awat tge best. The effect is convincing and most restful to the eyes and altogether irresistible. "I am looking forward to seeing the picture again. "It is my belief that this new process will revolutionize the motion picture industry." Take, for instance, out mixture of yellow and blue paint. Put this in front of a spectroscope, and analyze the light from it. You get yellow light and blue light - no green light at all. Physically, the mixture of paint reflects just the lights that the two separate paints did. The blending of these lights to make green is done, somehow, in the eye. The eye is fooled. It really sees blue plus yellow. It thinks it sees green. There are innumerable other ways to fool the eye on colors. For instance, mixed red and green (of the proper tints) look white. Certain yellows and certain violets, when mixed, also look white. The eye is simply unable to distinguish between a red-green mixture that looks white, a violet-yellow mixture that looks white, and a true white containing all six spectrum colors. The theory for all this is very uncertain. In the membrane that lines the back of the eyeball - the retina - there are two kinds of minute nerve endings - the rods and the cones. It is supposed that we detect colors through the sensitiveness of these nerve endings to different light vibrations. It used to be believed that the rods saw red and green and the cones saw blue and yellow. This was disproved. Then it was believed that the cones saw all colors, while the rods saw only light intensity, that is, differences between light and dark. Now even this is doubtful. The plain fact is that we don't know how we see. We know only that the mechanism is extremely complicated, that color vicion is especially so, and that, somehow or other, the nerve endings in the retina are variously stimulated by various lengths of light, and transmit the stimulus to the brain, where the consequent perception of varying colors is produced. But perhaps you are asking what all this has to do with color movies. It has everything to do with them. Color movies are possible at all only because we are able to fool the eye about colors. The new Technicolor process, for instance, is a "two-color" process. This means merely that we dye the films with two colors only, but by mixing them in different proportions we are going to try to represent all colors. A mixed red and green, you remember, will look like white. We are going to extend this. We are going to choose two colors, make various mixtures of these two colors and fool the eye, if possible, into thinking that it recognizes in these mixtures all of the six primary colors. The best proof that this can be done is that it has been done. As you view a two-color film like "The Toll of the Seam" you think you see all the colors. With a few exceptions to be noted later, the eye is fooled successfully enough. On the right side of this popular star's portrait are indicated the points in her make-up for black-and-white movies. See how entirely different is the make-up she will be likely to use in color movies, indicated on the left side of the picture. This probable make-up s based on results of recent experiment. In this particular feature, as in most other color movie processes, the two colors selected are a reddish orange and a bluish green. These colors are represented by two dyes, carefully chosen from more than 200 dyes that were tried. As I shall explain later, the original photograph consists of two separate images. One image, printed on one side of the film used in projection, is dyed blue-green; the other, printed on the reverse of the film, is dyed red-orange. Where the images overlap, these dyes blend. In projection onto a screen the light is colored byt the dyed images, the colors blend likewise, we see both images together, and the eye does the rest. What we really see are various shades and mixtures of blue-green and red-orange. What we think we see are all the colors of the spectrum. It all depends upon the capacity of the eye for being wrong about colors. it is just like the rabbit that you think you see coming out the conjurer's hat. This is what the two-color photograph is, but how is it taken? In exactly the same way. You take two photographs at the same time, one through a screen that lets pass only the blue-green color, absorbing all others; the second through a screen that abdorbs all but the red-orange. Suppose you are photographing a red and blue dress. The red parts "take" only on the photograph made through the red-orange screen. They will not show on the other photograph. The blue parts, on the other hand, take only through the blue-green screen. Now we dye one phorograph red-orange and the other one blue-green. The first represents the red parts of the dress, the second the blue parts. We put them together, one on top of the other (of course both are transparent), and we have a color photograph of the dress. All this is simple enough, but when we come to apply it to motion pictures, there are difficulties. The greatest is to discover some way of taking two photographs at the same instant, through the same lens. This problem Doctor Comstock solved in a very ingenious way. Just back of the lens of the camera he placed a silver mirror with holes in it. Half of its surface is polished silver, the other half is holes. It stands at an angle of 45 degrees to the beam of light. What happens to the light can be seen immediately from the diagram on page 59. One half of the light is reflected at a right angle. The other half goest straight on. The light beam from the lens is thus split into two beams, exactly alike. One of these beams is led through the blue-green color screen, to make the blue-green image at one point on the film. The other is led through the red.orange screen and makes the red-orange at the same instant on a lower portition of the film. Then the film moves and two new images are made again, one above the other. The film consists, then, when removed from the camera and developed, of a succession of double pictures (one below the other) all still in black and white. One picture of each pair corresponds to a blue-green image, the other to a red-orange image. This film, of course, is a negative. The next step is to make the positive print from this negative. On this print the pair of images taken at the same instant and that are separate on the negative must be brought together and superposed. The blue-green one of a pair is printed on the front of the positive film, the red-orange one is printed on the back of the same film. They must now be dyed. In this process the positive film is run through one dye bath that contains in solution the blue-green dye and the red-orange dye. The dyes are taken up selectively by the two images on the film; the blue-green dye "takes" only on the blue-green image; similarly, the red-orange colors only that image. The result of this selective dyeing is a colored positive print ready for projection. Aside from the technical difficulties involved win the perfection of color movies, there remain other sill more interesting problems - problems of directing, of acting, of the psychology of audiences. At present the movie actress's make-up, for instance, is a horrible looking mess of yellow cheeks and blue chin and forehead; blues for what is to be white, yellow for healthy flesh. For color movies all this must change. An effective make up, I believe, may prove to be greenish or violet, with reds inclining to orange, instead of the yellows and blues now used. Certainly, when the color movie make-up technique is so perfected as to simulate a beautiful star's natural color of complexion, hair and eyes, we shall have more fascinating photo plays than ever. Although enameled oilcloth, having its surface finished to imitate morocco leather, has come into very extensive use during the past five years, still it does not seem to have njured the manufacture of the genuine article. Morocco dressing establishements are still increasing in number and extent. Real morocco leather is made of tanned goatskin; but the term is now, in a general manner, also applied to tanned sheepskin, which is colored and dressed with a polished and corded surface in imitation of morocco. Having been informed that the manufacture of sheepskin into colored leather was carried on extensively and in a superior manner, in Albany, N. Y., by the firm of A. Williamson & Sons - old and experienced leather dressers - we recently embraced on opportunity of visiting their establishment, while briefly sojouring in the capital of the empire State. It is situated near the upper extremity of a street called Broadway, and although this street is very unlike its great namesake in New York, it can boast of a good morocco factory, in which some new and improved processes are carried on. Colored sheepskin is principally used for shoe bindings, and, in this establishments, the majority of the pelts are obtained gree nfrom sheep and lambs slaughtered in the vicinity. About 100,000 skins are dressed annually in it, and from these about half a million pounds of wool are obtained and sold. The first process through which they are made to pass is that of soaking and softening by water, to fit them for receiving the unhairing preparation. Formerly hydrate of lime was sprinkled in the inside of each pelt; it was then folded over with the wool side out and laid down on the floor, sometimes called "the pit." In this manner a whole pile or heap was made, and a heating action was engendered by which the roots of the wool were loosened, so that the fleece could be easily pulled or scraped off on a table afterwards. This method of loosening the roots of the wool was redious, occupying several days to complete, and the skins required constant watching, as they were liable to overheat and injury both to the wool and the gelatinous tissue. This was especially the case in warm weather; but the remedy for this trouble and these ills was lately introduced by the senior member of the firm, and is one of the most important improvements made, for many years, in this art. This is effected by a calcium orpiment compound, which they import and have also introduced among other manufacturers. It is made up into a thick creamy consistency, then applied to the inside of the skins which are folded over, wool side out, and laid in a heap, as before described. In twenty-four hours afterwards the skins can be deprived of their wool, and if they have to lie longer, no injury will result. In all cases the depilatory action is certain without injury to wool or skin tissue. The next operation is that of washing the skins prior to unwooling them. This latter manipulation is executed by placing them upon an inelined bench, and rubbing off the wool with a blunt tool. The flesh side of the skins is also scraped to remove slime and loose flesh, after which they are ready for the liming operation. They are now placed in vats containing milk of lime (slacked lime mixed with water), in which they are treated for about two weeks. The office of the lime appears to be that of a corrosive agent for the removal of grease in the skins, as it would prevent the action of the tannic acid afterwards. The lime does not act upon the gelatinous tissue, which alone forms the leather when combined with a tanning agent. A new discovery to shorten and cheapen this part of the process would be invaluable. The next operation consists in passing the skins through a bath of hen or pigeon manure, mixed with water, which softens them. After this they are washed and passed through a sour of dilute sulphuric acid, which neutralizes all hte lime that may remain in the pores of the skin, converting it into a sulphate, which is easily removed by a good washing in moderately warm water. After this they are dipped into a solution of common salt, sewed up at the edges with the grain side out, to form bags partly filled with tanning liquor, inflated and tied. 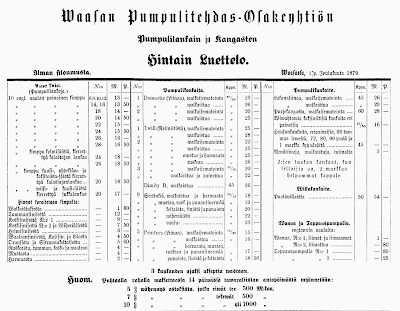 They are now placed in a tub containing an extract of Sicily sumac, in which they float and are kept in constant motion for several hours; and when they have absorbed a sufficient amount of the tannic acid in the sumac to convert the skin into leather, they are taken out, drained and rinsed; and if not to be colored, they are ripped out and dried in the atmosphere in sheds constructed for the purpose. They are stretched on boards, rubbed out to render them smooth, and tacked down so as to dry without wrinkling. These skins are generally filled three times with fresh liquor to tan them fully. The next operation is that of coloring. If the color is to be applied topically by putting it on the surface with a sponge, the skins are first dried. If they are to be dyed in liquors, they are sewed so as to have the grain side out, then mordanted, and afterwards handled in a tub containing the coloring agents. Prussian blue colors are imparted by handling the skins first in a dilute solution of nitrate of iron for about an hour, then in a warm bath containing the cyanide of potash and a little sulphuric acid. A beautiful blue is thus dyed. A scarlet is prepared with a mordant of the muriate of tin and cream of tartar; the red color is afterwards obtained by handling them in an extract liquor or cochineal. Purple is dyed by applying a cochineal color on the top of a prussian blue. Bronze is obtained from a strong extract of logwood and alum. After being dyed, the skins are rinsed, stretched on boards, rubbed smoothly down, tacked around their edges and dried. Topical applications of color are given to the grain surfaces in many instances. They simply consist of a strong extract applied with a sponge or a piece of cotton cloth; almost any color can thus be put on. A scarlet color is made by a topical application of an extract of turmeric upon a dyed cochineal red. To enable some of the coloring agents to go on evenly, milk and the white of eggsa re frequently mixed with them. These applications also serve to impart a metallic luster to the surface. Prior to rolling, and dyed skins are slightly shaved on the wrong side and trimmed at the edges. The subsequent finishing operations consist in rolling the skins on a table under a small weighted roller having a grooved face, and which is attached to a suspended arm which the operator moves back and forth until the roller has traversed the entire surface. This operation imparts a glossy cordovan surface to the leather. A second rolling, with the grooves running in an agular direction, gives the surface a diamond corded finish - the true morocco style. Formerly these skins were all finished by hand labor. The operatives stretched them on inclined boards, and rubbed over their surface with grooved balls of ebony held in the hand. Sometimes and extra finish is still imparted in this manner to skins. In this factory we saw the first aniline (popularly called Magenta) colors on morocco that have been applied in this country. The senior partner had been on a European tour last summer, and obtained the new color from abroad. It produces the most beautiful shades of purple, lavender and lilac upon leather. No coloring agent hitherto known can equal it. All processes for making leather from skins is not tanning, although most persons so term them. White leather is prepared with alum, and in some instances with a paste of flour. These are tawing, not tanning processes. It requires an agent, such as hemlock, oak or sumne, containing tannic acid, brought into contact with gelatinous tissue, to constitute the tanning process. Heavy sheepskins are frequently split by machinery, and for some purposes such leather is more suitable than any other kind. In thisfactory, a new machine for splitting had just arrived from England, and we were surprised to learn that, although it did not split so many skins in the same space of time as the American splitting machines, it was preferred because its work was of a superior quality. The cutting knife moves with a reelprocating sawing action, and is driven with a very high velocity. We have in this brief description of morocco dressing mentioned three new improvements not to be found in works published on the subject, viz. : the depilatory process, the cleansing operations with dilute sulphuric acid, and the new styles of colors. Morocco leather dressing proper is principally carried on in out cities on the sraborad or in their immidiate vicinity, as the goat skins are all imported from India, Africa, &c., and the sumac for tanning them from the island of Sicily - that land to which the eyes of the whole civilized world have recently been directed, on account of the wonderful exploits of Garibaldi and his heroic followers, fighting for the freedom of Italy. Wärjärin toimistoni joka tähän saakka on ollut kauppias N. Hartosella on muutettu kauppias W. A. Rönnmarkin luokse, joka wastaan ottaa ja ulosantaa minulle tulewia töitä, työt walmistan joutuun ja kunnollisesti. Mikkeli, marrask. 17 p. 1886. Proceed as directed in the last experiment, only use the nitrate of silver, instead of nitro muriate of hold. The process of crystalising, redissolving, &c., is the same. But the crystals of silver differ in color, being white, whereas those produced from gold are yellow. If a jar or boc be filled with hydrogen gas, and the silk suspended in it, the action of the gas, and consequently the revivification of the metals will be more uniform. For small figures, however, it may be as well to fix a stopper in the flask, having a small orifice through it, that the gas may be thrown with some force on the silk and will have more certain effect. A solution of muriate of tin may be managed in a similar manner, but none of these solutions can be thus revived on paper. Take any quantity of nitro muriate of gold, and evaporate by exposing it to a gentle heat in a glass tumbler or phial; the gold will form itself in crystals on the bottom and sides of the vessel; collect these crystals and dissolve them in ten times their weight of pure water. Then put a gill of water into a common flask and add one ounce of graduated zinc, and one fourth of an ounce of sulphuric acid. Hydrogen gas will be evolved, and rise through the neck of the flask, which must not be stopped. Immerse a piece of white silk in the above mentioned aqueous solution of gold, and expose it, while wet, to the current of gas as it rises from the flask; the gold will soon be revived and the silk will become beautifully and permanently gilt. Any letters or flowers may be drawn on the silk with a camel hair pencil dipped in the solution, and on being exposed to the action of the gas, will be revived and shine with metallic brilliancy. The silk must be kept moist with water till the gold is revived. Zinc may be prepared for the above purpose, by melting it and stirring it continually with a stick or iron rod while it is cooling; or it may be pulverized with a hammer as soon as it becomes solid. The Art of Painting. Plain Painting in Oil Colors. Plain Painting in Oil Colors. White is considered as not only a principal color in painting, but the base or foundation of all light colored paints. White lead is the principal white in use, though a more delicate white called slake white, is used in ornamental work. Several common colors, known as lead color, slate color, &c., are produced by mixing lampblack with white lead in different proportions. A small quantity of Prussian blue, finely ground and added to white lead, constitutes the common sky blue. Minute quantities of blue and yellow added to white, produce the delicate pearl color, so much in vogue for parlors and halls. Straw color is produced by the addition of a little chrome yellow to white: and pead green by addition of Paris green. A beautiful light purple or peach blossom color is produced, by adding to white lead, small quantities of ultramarine blue, and drop lake. It is needless to specify the exact proportion of the ingredients in these compounds; the only rule being to add the coloring ingredients in minute quantities till the required color is produced. The most common color for floors, is composed of white lead and yellow ochre, in about equal quantities by weight, with the addition of one ounce of red lead to each pound of the mixture. In painting carriages or ships, a great variety of compound colors are used, a few of which may be here noticed. The best black is composed of lampblack and Prussian blue. A dark green consists of a mixture of chrome green and Prussian blue. A brilliant plum color is produced by a mixture of lampblack and vermillion. Olive color is produced by mixing lampblack and chrome yellow. A brilliant orange color is produced by mixing chrome yellow and orange lead - (a pigment similar to red lead, but more refined.) A stone brown is composed of lampblack, yellow ochre and Venetian red, equal parts: the addition of white to this compound reduces this color to a drab, or light stone color. A mixture of lamp black with Venetian red, constitute the chocolate color. A bright rose color, which is much used in ornamenting, is composed of white lead and drop lake. As a general rule, the colors should be mixed with oil and ground separately before being compounded, or mixed together; but should not be diluted any more than is required for grinding, until the color is perfected. We shall proceed with some instruction in carriage painting in our next number. Walkea tuli eilen wallalleen noin kello 12:n aikana päiwällä wärjäri Stenbergin perillisten wärjäyslaitoksessa ensimmäisessä kaupungin osassa. Tulipalo ei kestänyt pitkää aikaa, waan sammutusmiesten täytyi kuitenkin repiä rautainen katto rikki, että sen kautta saiwat wettä ruiskutetuksi tulen sammuttamiseksi. Syytä tulen irtipääsöön emme warmaan tunne, mutta arwattawasti oli tuli päässyt irti jostakin takkatorwen reiästä ja siten sytyttänyt kuiwaushuoneen wälikaton tai seinän. Take asphaltum, pulverize it, place it in a har or bottle, pour over it about twice its bulk of turpentine or benzile, put it in a warm place, and shake it from time to time. When dissolved strain it and apply it to the wood with a cloth or stiff brush. If it should make too dark a stain, thin it with turpentine or benzole. This will dry in a few hours. If it is desired to bring out the grain still more, apply a mixture of boiled oil and turpentine; this is better than oil alone. put no oil with the asphaltum mixture, as it will dry very slowly. When the oil is dry the wood can be polished with the following: - Shellac varnish, of the usual consistency, two parts: boiled oil, one part. Shake it well before using. Apply it to the wood by putting a few drops on a cloth and rubbing brisky on the wood for a few moments. This polish works well on old varnished furniture. Sattuneista syistä julkisella huutokaupalla, joka toimitetaan lauantaina 3 p. ensi elokuuta k:lo 3 j. pp. Akaan pitäjän kirkolla, lähellä Toijalan asemaa toistamiseen ulostarjotaan wähimmän waatiwalle mainitun kirkon maalaus sisältä osittain wesi- ja öljywärillä, käyttäin myös tammenwäriä ja kultauksia. Urakkamies, jolta waaditaan täysin tyydyttäwä takaus työn täyttämisestä ja mahdollisesti myönnettäwistä ennakkowaroista, toimittaa itse paitsi maali-aineita, kaikki telineet; likemmät määräykset eritellään tilaisuudessa, jossa toimikunta myös pidättää puolen tuntia aikaa tutkia ja hywäksyä tehtyjä tarjouksia. Workers who build Lockheed planes now are protected by a safety-first color scheme applied to their machines. Moving parts are identified by cream-colored paint, and stationary parts by gray, as in the brake for bending sheet metal shown at right. [KUVA PUUTTUU] In other applications, suitable colors make control levers and knobs more clearly visible. Fourteen daylight trials show the best contrasts to be black agains a yellow background, and green against white; the worst, red against green, and blue against red. Among industries using complicated piping systems, paints of different colors long have been used to distinguish pipes carrying water, steam, gas, refrigerant, acid, and various other chemicals.